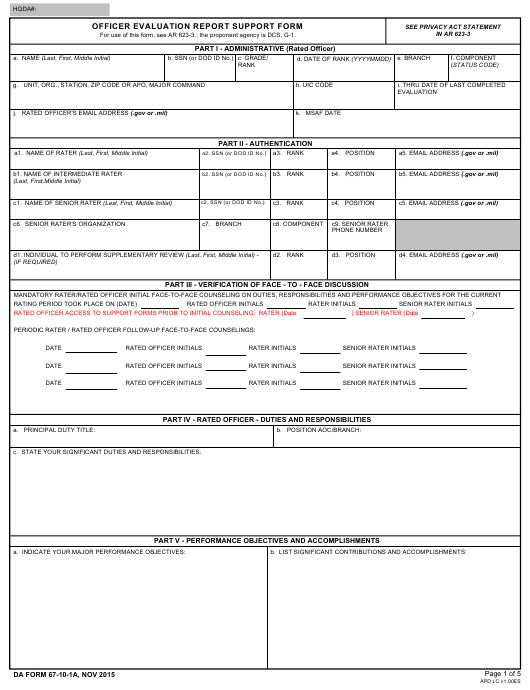 DA Form 67-10-1A also known as the Officer Evaluation Report Support Form is a document used during the process of Officer Evaluation within the U.S. Army. This form assists the rating chain in compiling a report for the Department of the Army (DA) on the performance and potential assessments of a rated officer. This latest edition of the support form was released in November 2015. An up-to-date and fillable DA 67-10-1A is available for download below. The form - sometimes referred to DA Form 67 for short - should not be confused with the DD Form 67, Form Processing Action Request, with the latter being used to request a cancellation or revision of an existing form or adding a new one to the Department of Defense inventory. What Is DA Form 67-10-1A? The OER completion process requires the rating officials to make an assessment of the rated officer's performance according to their assigned position and to evaluate their potential for service in positions of a higher rank. The DA Form 67-10-1A allows the rated officer to self-evaluate themselves according to six criteria: their character, presence, intellectual abilities, leadership skills, development, and achievements. The officer is also expected to set goals for future development. The rated officer receives their copy of the supporting form at the beginning of the rating period. It's their responsibility to fill out parts of the form and hand it to the rating chain during face-to-face counseling sessions. At the end of the rating period, the completed form enables rated the officer to provide some personal input to completed OER. For use of this form, see AR 623-3 ; the proponent agency is DCS, G-1. PARTS I-IV INSTRUCTIONS. AR 623-3 outlines the administrative requirements necessary to complete these portions of the support form. organization's mission, problems, priorities, and similar matters. c. Counsel the rated Soldier. gives the rated Soldier a guide for performance while learning new duties and responsibilities in the unit of assignment. required, and assess developmental progress. Summary or key comments will be recorded for inclusion when preparing final OERs. (1) Ensure support forms (or equivalent) are provided to all rated Soldiers they senior rate at the beginning of and throughout the respective rating periods. provided on the rated Soldier's support form. rater at the earliest opportunity. A. CHARACTER: Army Values, Empathy, Warriors Ethos/Service Ethos, and Discipline. organizational, training, and operational duties. Personal beliefs related to upbringing, culture, religious backgrounds, and traditions are also central to character. while maintaining a mission and organizational focus. balance, and stability. Expertise: Possessing facts, beliefs, logical assumptions and understanding in relevant areas. hinder trust. Keeps people informed of goals, actions, and results. Follows through on actions related to expectations of others. determine the parties involved in decision making, decision support, and possible interference or resistance. 2. Negotiates, builds consensus and resolves conflict. and a positive attitude. Is resilient. Remains decisive after discovering a mistake. Acts in the absence of guidance. Does not show discouragement when facing setbacks. appropriate knowledge of equipment, procedures and methods; recognizes and generates innovative solutions. Uses knowledgeable sources and subject matter experts. identify possible cause-and-effect relationships. 6. Seeks diverse ideas and points of view. Encourages honest communication among staff and decision makers. difficult problems. Discourages individuals from seeking favor through tacit agreement. means to reinforce with the speaker that you are paying attention. Reflects on new information before expressing views. Communicates (continued) - 2. Creates shared understanding: Shares necessary information with others and subordinates. Protects confidential information. communication techniques: States goals to energize others to adopt and act on them. Uses logic and relevant facts in dialogue; expresses well-organized ideas. customs, expressions, actions, or behaviors. Demonstrates respect for others. unit quickly. 2. Encourages fairness and inclusiveness. Provides accurate evaluations and assessments. Supports equal opportunity. Prevents all forms of harassment. reactions to new or conflicting information or opinions. Guards against groupthink. 4. Creates a learning Environment: Uses effective assessment and training methods. themselves. Allocates decision-making to the lowest appropriate level. Acts to expand and enhance subordinate's competence and self-confidence. Rewards initiative. welfare, and development). Stands up for subordinates. Routinely monitors morale and encourages honest feedback. unnecessary information efficiently. Reserves time for self-development, reflection, and personal growth. Considers possible motives behind conflicting information. and criticality of information to improve understanding. Identifies reliable resources for acquiring knowledge. Sets up systems of procedures to store knowledge for reuse. 5. Maintains relevant cultural awareness: Learns about issues of language, values, customary behavior, ideas, beliefs, and patterns of thinking that influence others. and peacemaking missions. 7. Maintains self-awareness: employs self understanding and recognizes impact on others: Evaluates one's strengths and weaknesses. and proficiency. Uses experience and knowledge to improve future performance. Counsels, coaches and mentors subordinates, subordinate leaders, and others. 3. Facilitates ongoing development: Maintains awareness of existing individual and organizational development programs and removes barriers to development. realistic, mission-oriented training. Sustains and improves the relationships among team or group members. Provides feedback on team processes. depending on other tasks are executed in the correct sequence. Limits over specification and micromanagement. coordinating, and regulating subordinate's actions and activities. Mediates peer conflicts and disagreements. and conduct rehearsals. Continually seeks improvement in operating efficiency, resource conservation, and fiscal responsibility. Attracts, recognizes, and retains talent. preventing accomplishment of the mission. builds on successes. Explores reward systems and individual reward motivations. lessons learned and facilitate consistent improvement. Determines the appropriate setting and timing for feedback. required support. Keeps track of task assignments and suspense's; attends to details. Adjusts assignments, if necessary. causes, effects, and contributing factors of problems. Considers contingencies and their consequences. Makes necessary, on-the-spot adjustments. focus on those branched detailed, functional designated, have completed branch qualification and anticipate broadening and advance civil schooling opportunities. The officer will also state self development objectives based on MSAF assessments (optional) or other identified areas required for development. At the beginning of the rating period, the rated officer will be given two copies of the DA 67-10-1A with one belonging to the senior rater and the other to be kept by the officer. Within 30 days after the beginning of the rating period, the rated soldier will undergo counseling. During the session, the rating officer and rated officer will discuss the scope of the rated Soldier's duty description, performance objectives and set personal developmental goals. Parts I through III are administrative and provide identifying information and authentication from all parties involved in the evaluation process. Parts IV and V are filled out by the rated officer. Part IV is for describing their duties and responsibilities. Part V is more detailed and must include an in-depth self-evaluation of the officer's character, military and professional bearing, fitness, confidence, mental agility, and expertise as well as an overview of leadership skills and achievements. DA Form 67-10-1 (Company Grade Plate (O1-O3; WO1 - CW2) Officer Evaluation Report) (CGP-OER) is used for 2LT through CPT and WO1 through CW2. DA Form 67-10-2 (Field Grade Plate (O4-O5; CW3-CW5) Officer Evaluation Report) (FGP-OER) is used to evaluate major (MAJ) through lieutenant colonel (LTC) and chief warrant officer three (CW3) through chief warrant officer five (CW5). DA Form 67-10-3 (Strategic Grade Plate (O6) Officer Evaluation Report) (SGP-OER) is used when evaluating colonel (COL) performance. DA Form 67-10-4 (Strategic Grade Plate General Officer Evaluation Report) (GOR-OER) is used with brigadier generals (BG) or higher.